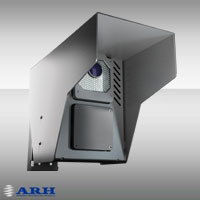 SpeedCAM speed enforcement camera - ARH Inc. The SpeedCAM is the combination of FXCAMd camera, an embedded industrial computer with installed CARMEN FreeFlow software and radar. The camera module provides ideal images for the embedded PC which processes the images with CARMEN® license plate recognition technology. The image capturing is triggered by the radar and the motion detection together. Full processing is performed inside the unit (like time stamp application). Images, license plate texts, location, speed and time are stored in the camera database with easy access through a built-in web-server. This unit is especially useful at low infrastructure locations, due there is no need for separate PC close to the camera. The advanced camera technology is dedicated for 24/7/365 automatic number plate recognition.